Hi, Wolfie is back but you knew that because it's plastered all over Twitter. Just in case you missed it though, I'm here to let you know... because obviously people who don't keep up to date with new music on Twitter's first stop is WIIHAMB. Yep. I wonder if people refferred to as being "back" get annoyed like "What do you mean? Where did I go? I've been here the whole time." Let me know, if it is annoying I won't do it again, or at least I'll try not to until I inevitably forget. All of my posts about Wolfie prior to now have been super weird (find them here if you're interested) so I feel it's only right to continue that tradition. My personal favourite is the one for 'Come Over' where I pitched an idea for the music video. 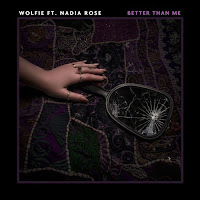 Wolfie's new single is called 'Better Than Nothing' and I think it feels like this is really the beginning of her time, right? It does, doesn't it? And we all know that I'm not Nadia Rose's biggest fan but enlisting her on this track seems like a pretty good A&R and PR move so shout out to The Industry. I'm actually really struggling to pinpoint exactly what makes 'Better Than Nothing' so good, which sounds terrible but I guess that means it's just an effortlessly great R&B song. In terms of potential for urban radio this pretty much hits every mark right? Sorry, I have no idea who died and left me in charge of chairing industry type discussion as portrayed in this paragraph. I'm excited for Wolfie this year, I didn't realise I was, but now I definitely am. Excited to hopefully (I mean, it's probably fairly likely) see her live this year too; I reckon her stage outfits will be very on point.